Step into the Margaret Upton Conservatory of Music on campus and you’ll hear the sounds of young musicians perfecting their art. These students may see the building as a home-away-from-home, and that’s because Olivet’s music program is offering them an impeccable education, complete with meaningful professor-student relationships and expert guidance. Timothy Flynn, professor of music, notes that Olivet’s program is customizable depending on the interest, strengths and vocation of students. “With a bit of thoughtful creativity, students can potentially design a program tailored just for them,” Professor Flynn said. 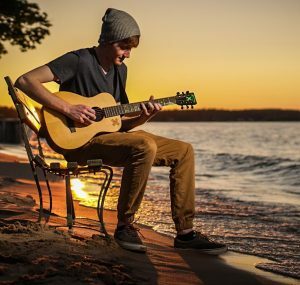 “Benefits of studying music at Olivet include the diversity of the major and minor concentrations and flexibility we offer. Professor Flynn also believes that students who choose the music program will benefit from the “supportive contact with faculty and studio professionals and the close-knit population,” an experience students may not be able to have elsewhere. Samantha Lewis, right, performs in the Wind Ensemble. 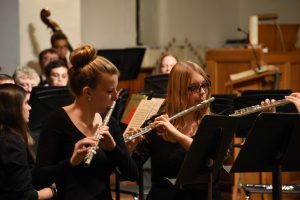 Senior music major and flautist Samantha Lewis encourages high school students to join Olivet’s music program because not only is the program strong, but the professors and other students become family. Not only does Olivet’s music program prepare students for careers in music, it also helps them develop professional skills. Olivet’s music program prepares students for graduate school, where a wide variety of career possibilities exist. Samantha hopes to become a music therapist while Justin’s aspirations are in academia. Both Samantha and Justin are grateful for their Olivet education because they’ve been able to pursue their passion while receiving quality guidance and exceptional instruction. Justin speaks highly of Olivet’s music program as a means for him to improve his skills and further develop his passion each and every day. Samantha feels similarly. With the opportunity to learn and grow in her musical studies, she’s cemented her love for music and looks forward to sharing her talents post-graduation. “Music is an art that will stay with you for the rest of your life,” Samantha said. Armed with the skills they’ve learned in OC’s music program, Justin and Samantha are ready to continue their passion and jump into careers in what they love most. To enter the music program, prospective students must go through a selective admissions process, including an audition. “Interested and dedicated students who like a challenge and enjoy working hard are encouraged to contact us for specific audition information,” Professor Flynn said. To learn more about Olivet’s music program, contact the Office of Admissions at 800.456.7189 or admissions@olivetcollege.edu.